Businessman's recipe to lessen India's crime rate is this: make the underworld an organized industry, and give every criminal a decent salary, and there will be no want, no poverty, and no crime. This is actually implemented and proved by its protagonist, whose only aim, as the promos rightly tell you, is to make Mumbai, err, pee. Urological targets aside, Businessman is a Puri Jagannadh movie that mostly gets it right - all cheek and no clutter. The writer-director deftly combines the several forces of dialogue, edgy camera work, background score and energetic acting, to give you an entertainer that is engaging enough to make the following detail skip your attention: this movie doesn't have a comedy track. Briefly put, the plot follows the mind-games that a gangster Surya (Mahesh Babu) plays with Mumbai's powers-that-be, to gain total control over the region. Beginning by endearing himself to a pocket of the Dharawi slum, Surya moves on to bigger things in life. So we are treated to the politics of a Mayor election, Delhi negotiations, and election sops, all masterminded by a man with in-your-face amorality, who simply cannot go wrong. And of course, the romance with the Police Commissioner's daughter. Thanks to a Pokiri-Dookudu hangover, there's also another question that keeps you hooked - what is Surya's background? Unfortunately, the answer isn't very satisfactory, and this, along with the fact that the movie itself has an unclear denouement, might disappoint viewers. However, Puri Jagannadh (who walks in for a very welcome 20-second cameo) is at his crowd-wooing best, clearly, since it is his dialogues that keep every scene throb alive with zest. It is important to also note that his lines aren't just vacuous material meant to titillate front-benchers - even if you're not a loyal fan of the writer-director, you will agree that these "punch-dialogues" have much philosophy (and more cynicism) to ruminate on. Critics have good reason to lament his increasing dependence on swear words, but there's no denying the fact that when this audacity is combined with the learned insights of an informed thinker, it makes for seriously potent ammunition. So potent that he doesn't even need help from Mahesh Babu's star quality. Which, in turn, is so potent that he seemingly doesn't need a Puri Jagannadh dialogue to bring on the hysterical shrieks. This fusion of independent charismas - of the performer and of the conductor - results in a movie crisper than it probably could have been. Indeed, there are certain scenes and dialogues in Businessman that might put you off because, on the face of it, they're obscene (like the one in which Surya unctuously tells the politician, played by Sayaji Shinde, that he loves him and that he must treat him like a girlfriend), but what we have here are brilliant moments that have a mysterious mix of corniness and wit, that have been delivered with just the effect they were intended to be delivered. Brahmaji, Nasseer, Sayaji Shinde, Prakash Raj, etc. are all suitable accessories to the script. However, the practice of featuring air-headed heroines continues, with Kajal playing Chitra, the Commissioner's daughter, and this is perhaps the only thing grating about Businessman. Meanwhile, the background music adds just the amount of pulsating urgency that the script demands. And Saar Osthara hugely helps. Businessman is recommended, especially for the unfussy Telugu film fan. However, it is rated A, and had there been lesser of Mahesh Babu's little finger, Businessman could have been more fun. This movie is an insult to my intelligence ! Puri Jagannath should be banned from making movies.. and if a hero like Mahesh babu is encouraging these movies by wasting his valuable time, he should rethink again.. I want to give a negative rating to this film.. Awesome Movie Prince Rocks.... BlockBuster....BlockBuster....BlockBuster..... !!!!!! Guys , watch the movie and just enjoy the performance of mahesh......one should appreciate the rocking performance...rest all normal, just treat this movie as a movie, not real life. Mahesh and Puri are going to feel so bad when this hangover of false heroism and false success comes down on them. That day it is going to make their lives miseable. I am just waiting to see their siblings grow up and ask them a simple question. Papa, why did you do this film??? Have some mercy on us. Mahesh, you have actually lost your diction and timing of emotions while delivering dialogues. 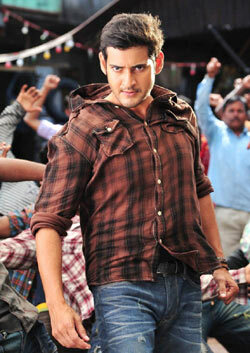 This is particulary visible in the movies Khaleja, Dookudu and now this movie. As an actor you should have control over broadspectrum of emotions that are part of human psyche. You have become so boring with only one kind of emotion (which is aggression) in dialogue delivery for every kind of scene. How can you show same emotion with a villain and your lead actress and supporting actors. This is too much of monotonous fare being dished out in the name of aggressive heroism. In fact it is regression from being a good a matured actor. Wake Up ! Pros: What do you mean? Cons: Again, don't you know them yet? people who r writing here did not seem to mature . .
i used to watch mahesh babu movies . . i used to like him . . i do like still . .
we need a fresh perspective . .
build communes as suggested rajneesh achary . .
thanks to puri fr providing film.s . .
a movie throws light on some aspect . .
will yu ban Godfather movie too -. you seem to be banning every movie that goes against ur wy .. .
dialogues are nice . . if you can't understand bagavatgeeta . .you will miss movie . .
bagavatgeeta has long been toppled by various authors . . did not ever get right treatment . .
Spot on anon critic. As sekhar mentioned below..puri is in pokiri hangover. This is a bore fest. No script. this anon_cric must be someone frm movie industry . .
that is more bettr . .
vaadu rgv aithe antee .. avakapothe antee . .
Puri is dangerously close to becoming another RGV, too hung up on seeing his own whims and fancies on the screen and imposing his own fantasies on the audience. Relying only on Maheshs star power and trying to make a full movie out of punch dialogs is a huge risk and obviouly, there isnt any thing in this movie for non Mahesh fans (antis as called by fans cricles). Puri Jagannath is really in need of blessings from Lord Jagannath and he can choose the path he has advocated in the movie. I was expecting to see a more critical review in this site. This review appears to have been influenced by watching the movie first day with all the noise and excitement generated by fans. It is actually a very different fare when you see it in a quieter ambience. It doesnt appear all that potent. It is meant for the fans and those who like variety. One thing is for sure - only two actors could have pulled this off, one being Mahesh and the other is..
Its a boring monologue with Zero story dragged for more than 2 hrs. Mahesh babu makes an idiot, replacing another lesser idiot, the PM of India with 35000 crore hawala money and we are idiot audience who has to bare all this crap. fullhyd.com has 700,000+ monthly visits. Tell Hyderabad what you feel about Businessman!